Christie + Co's Office Interior Fit Out! Here at Oaktree Interiors, we are extremely proud to announce that we have commenced work on Christie + Co's office interior design and fit-out for their London HQ. We are excited to have started work on this exciting and unique office design, and are already looking forward to completing the office space to allow the Christie + Co team to get back to work. Who Are Christie + Co? The professional Christie + Co team has provided extremely valuable advice to clients in specialist sectors for more than 75 years. The business was established in London in 1935 and, over the years, has successfully expanded its professional brokerage and advisory services across the entire country. As if that wasn't enough, Christie + Co regularly work alongside businesses throughout Europe. The agency operates from an extensive network of offices across Europe, including several in the UK, along with property in Austria, France, Finland, Ireland, Germany, Spain and Poland. What Does Christie + Co's Office Interior Design Involve? Spread across multiple floors, at Whitefriars House in London, EC4Y 0BS, the major challenge involved in the project has been working around the active Christie + Co team. With a range of essential services being provided to clients and businesses all over the world, the agency's workforce couldn't afford to stop working for even a single day. Our office interior design has involved changing the entire environment of the space and helping to evolve it into a light and modern atmosphere. The entire office space will be relaxed and comfortable, without having to sacrifice a sense of professionalism and high-quality. 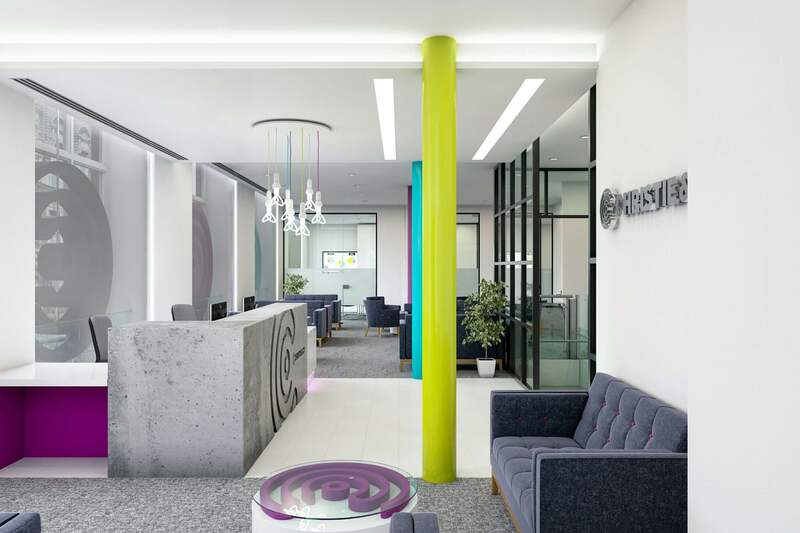 Christie + Co's branding has taken a major role in the office interior refurbishment, with their logo appearing as part of major wall decorations and the reception, along with smaller feature pieces such as waiting area coffee tables. In terms of colours, we are including distinct feature pieces to make the entire office design stand out without being overwhelming. Bright purples, greens and blues are all used tastefully to highlight the fairly neutral, albeit light, design of the office space. Works are currently under way and are scheduled to be completed in a few weeks' time. 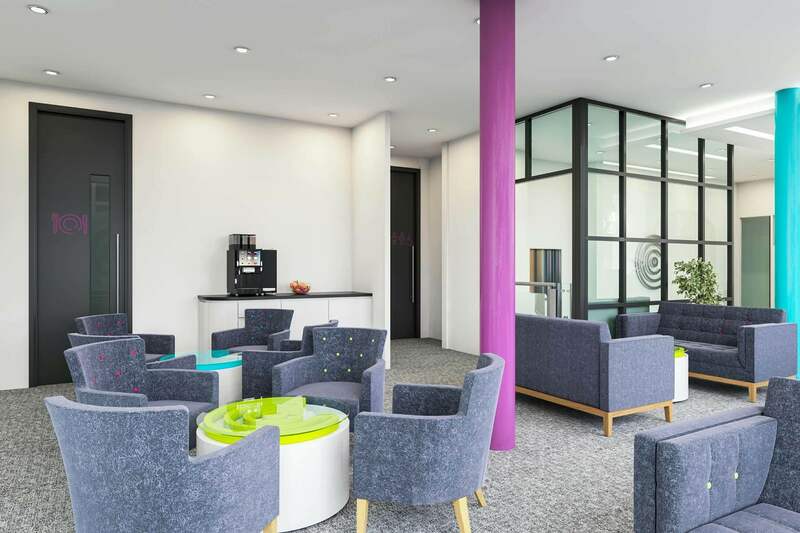 The vibrant colours, combined with intelligent office design, have been meticulously created to ensure that all staff and directors can work in a comfortable and practical area. Here at Oaktree Interiors, we are proud to offer completely bespoke office design services to ensure that your office space can fully complement your working life. For more information on the extensive and completely unique services that we can provide, please don't hesitate to get in touch with our team today on 0845 474 3556. Alternatively, you can email any questions or concerns that you might regarding our office interior design services to hello@oaktreeoffice.com.